Home Mobile What Makes Samsung Galaxy S4 Standout? What Makes Samsung Galaxy S4 Standout? June 8, 2013 , Comments Off on What Makes Samsung Galaxy S4 Standout? While the tech world as a whole is making advancements at a lightning fast speed, it is the cellular phone market that is surprising us with latest, far efficient and way more stylish phones every other day. Smartphones are the ‘in’ thing of today that have taken the world by storm. Aside from providing addictive apps and fantabulous features hence quenching the thirst of the tech savvy new generation, they also are a symbol of showing off to your peers. Now when it comes to the smartphones, Samsung Galaxy S4 is being sold like hot cakes. Galaxy S3 and 4 aren’t much different when it comes to their basic outlook. Both have a rectangular handset with round edges. However, Samsung Galaxy S4, unlike S3 or Samsung Galaxy S2 is relatively more stylish with a flat, smooth back. Then, Samsung Galaxy S4 has made their users dancing-on-air- happy by enlarging the screen from 4.8 inches to 5.0 now. 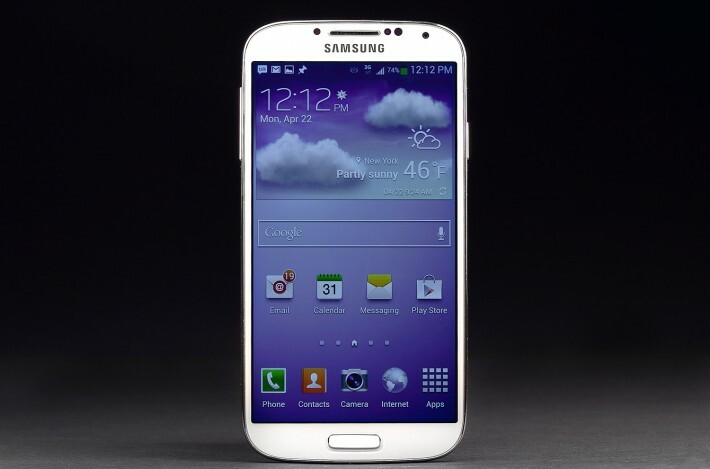 The best part is, Samsung Galaxy S4 has a brilliantly slim bezel, making the screen look even bigger. Yes, it’s a big phone and you’ll love holding it in your hand. The wide HD super AMOLED screen makes you fall in love with the S4 at first glance. It makes the texts unbelievably clear and easy-to-read and there’s nothing like watching a video on a large S4 screen. Moreover, it is light and slim. Despite having a large screen and innumerable features and apps, the size of Galaxy S4 is pretty cool. It’s slim and light-weight, which makes it even easier to carry it off. It’s time now to replace your Galaxy S2 and Samsung Galaxy S3 with an S4. Features that set Samsung Galaxy S4 apart from any other set are many but we’ll shed light on a few. The first being the eye-control, smart pause feature. This enables your smartphone pause the video on its own when you’re not looking at it and automatically resumes it, the moment you turn a glance towards it, cool, isn’t it! Smart scrolling is another option Galaxy S4 users can enjoy. It lets you view the pictures and images by merely titling your device, no need to hassle with the frequent clicks. Just tip it to enjoy viewing the picture at another angle. Hovering feature of Samsung Galaxy S4 is something that’s making swirls. Well, now you can drive around and without touching the screen can attend or refuse a call. All you got to do is, hover finger/hand over your phone and there you go! Now that’s called a smartphone! Galaxy S4’s camera is undoubtedly great, when you’re using it in good light. With 13 megapixels, as opposed to 8 megapixels offered in Samsung Galaxy 3, you definitely can take some great shots with your phone. Do we need to carry an extra bag for our camera everywhere we go now? We’re so relieved. I won’t blame you if you’ve set your heart on buying an S4 now, however, before you go out on a shopping venture; keep a good sum of money in your pocket, it’s going to make a small dent in your pocket. So, keep your budget in mind. Shopping around is a great advice for finding the best deals in town. Find a good, reliable retailer to buy your dream phone. Happy shopping! Is It Better to Enroll in a Traditional or Online MBA Program?